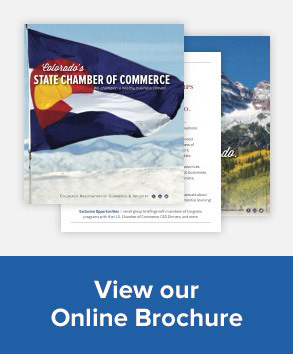 The Colorado Chamber of Commerce and Industry (The Colorado Chamber) and its associate organizations are committed to respecting your privacy. You can visit us on the web without identifying yourself or revealing any personal information. If you choose to provide us with any information by which you can be identified, you can be assured that it will only be used to support your relationship with us. On our secure web sites that we maintain for our visitors, you can make requests and register to receive materials. In order to tailor our subsequent communications to you and continuously improve our products and services, we may also ask you to voluntarily provide us with information regarding your personal or professional interests, demographics, experience with our products, and contact preferences. The Colorado Chamber and its associate organizations will not sell, rent, or lease your personally identifiable information to others unless we have your permission or are required by law. We are committed to ensuring the security of your information. To prevent unauthorized access, maintain data integrity, and ensure the appropriate use of information, we have put in place appropriate physical, electronic, and managerial processes to safeguard and secure the information.